A native of Beverly, Massachusetts and graduate of Beverly High School. Dr Peterson returned to his hometown after a 15 year career in the military with the Army and Navy. 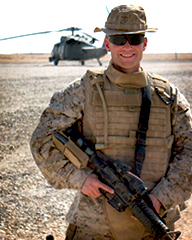 He was deployed for 6 months in 2009 to Afghanistan with a forward surgical team providing orthopedic care to the Marines in support of Operation Enduring Freedom. He was also deployed to Indonesia on the US Navy Hospital Ship Mercy on a humanitarian mission there after the earthquake and tsunami in 2003. He did a sports medicine fellowship at Harvard/MGH in 2007-8 and was one of the team physicians for the New England Patriots, Boston Red Sox, Boston Bruins, New England Revolution, and Harvard University. He provides general orthopedic care with a strong emphasis on sports medicine.